Since 2010 we have been involved in the production of HIGHTEX heat-sealing equipment for industrial fabrics, such as inflatable products and inflatable products, awnings and shades to truck tarp curtains, tents, banners and billboards, ducting / ventilation, geo liners and filtration products. The first S280 series seam sealing machines were delivered to manufacturers in 2008 and this was the start of a success story. 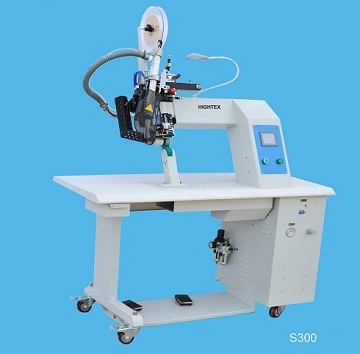 The on-going commitment to new development is illustrated by the new S280, where the valuable feedback received from existing HIGHTEX machine users throughout the world has been converted into machine reality. All necessary data that needs in machine operation can be input from the touch panel. Password operation become possible, machine operation data protects from unauthorized access. Each upper and lower roller are driven individual motor, differential drive ratio eliminates puckering / creasing problem. Self-diagnostic fault finding system is created, faults identified on LCD screen with suggested solutions. Nozzle mount and movement is modified, nozzle can be positioned very accurately. Full functional control for roller reverse turn, prevents seal skipping. Applications: for sealing seams with tape for various proof purpose such as water, gas, dust etc., including rain coats, wind coats, awnings, fireman uniform, outerwear, underwear, sportswear, rucksacks, footwear, shoes, clothing for military and public authorities, backpack, balloons, car components, inflatable, boats, Balloons, protective wear, clean room garments, tents medical industry and filter bags. As well as seam preparation for foam padded automobile seats, sofas, luggage, head- and side rests. The concept has been to create a machine that is “User friendly” – a unit that is easy to understand, adjust and operate whilst maintaining the excellent reputation for reliability. We are confident that the new S300 machine meets these criteria and that the new technology will provide users with significant advantages. The pressure of upper cylinder is adjustable according to different thickness of material. 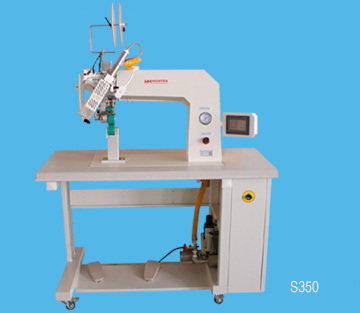 The S350 series seam sealer is specially designed to provide ease of operation, consistency and quality complete with a range of optional modular attachments to meet today's requirements for more flexible equipment. The simple to use and comprehensive control system includes a digital dual display temperature controller. The dual display temperature controller has an accuracy of ±1% and interacts with the machine's PLC to ensure the heater is at the set temperature. If the correct temperature has not been reached the machine is disabled. The angled post with low profile scissor ensure increased visibility for the operator. Adjustable delay timers and drive stop can be set to eliminate “Skipping” during starting and stopping while sealing long seams. The S400 is used specifically in thread less technology. Provides totally watertight seams. Uses a quiet but powerful 35KHZ generator. Fully certified and CE marked against hearing damage from ultrasonic generator noise. There is a microprocessor control with a HMI screen operator interface. 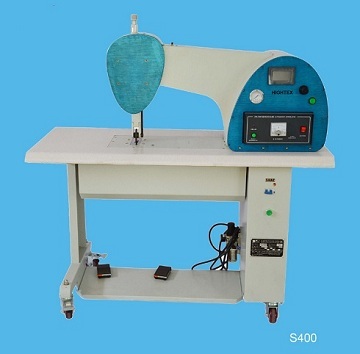 The design and function of the machine provides excellent control in the constructions of curved seams and is operated just like a standard sewing machine. Capable of handling all types of materials with synthetic content, stretch materials, laminated and coated materials, fleece and soft shell fabrics, non wovens, cotton blends etc. Uses minimal seam allowances creating flatter seams. Improves comfort levels on next to skin garments. Applications: underwear, sportswear, medical gowns, outerwear, rucksacks, bags, nylon-pvc and nylon-pu, oxford cloth and rubber cloth rain coats, jackets, wind coats, snow-suits, ski wears, nylon tents, military water-proof coverings and bags, light vehicle coverings, car coverings, etc. The S600 is the most efficient and energy saving hot air welding machine on the market today. Our adjustable energy saving function kicks in when the machine has been lying idle eliminating wastage of precious resources. The low air consumption of 3 C.F.M of which most is used through the heater means that the power consumption is also kept to a minimum. Engineering reliable and easy maintenance machines is key to our success. Ensuring that our equipment has very little down time and that problem solving is never over complicated that's why you will not find unnecessary electronics and software in our machines which can heighten the risk of failure and expensive parts replacements. This clever function allows the operator to slow the machine down on heavy materials such as 3-layer fabrics where the cross over seams need more pressure and heat. 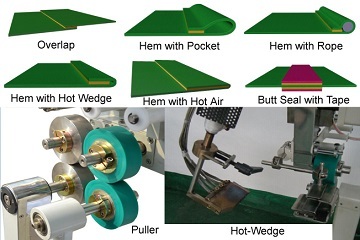 Normally in production the garment would be removed after tape sealing and re-stamped on another machine in these areas where seam tape is prone to lifting. By using this feature this additional operation is removed from the manufacturing process. 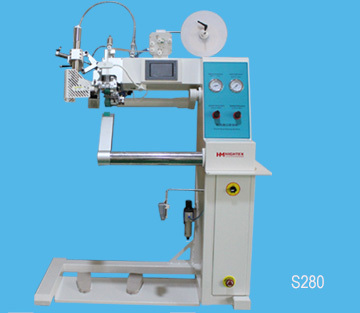 S700 Hot air welding machine is rotary hot air and hot wedge sealing machine to join thermoplastic fabrics and industrial fabrics using very precise heat speed and pressure settings. For example PVC laminated fabrics, Vinyl coated fabrics, Vinyl Films and Polyurethane (PU) coated fabrics, Polyurethane films, Polypropylene-coated fabrics, Polyethylene (PE), Thermoplastic rubber fabrics, acrylics and others. 7. Service and support are important considerations in your selection of a hot-air welding machine. We understand how critical it is that your equipment work correctly. Applications: Inflatable products manufacturing like Inflatable boats, inflatable kayaks, bouncers, inflatables water games, slides, castles and other curved products Awning and marine cover applications Tents, tarpaulins, other various products Signs, finishing banners with hems & pockets and other advertising inflatable. 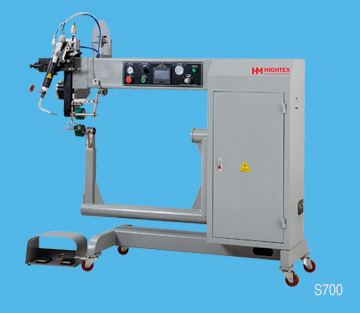 HIGHTEX #S701 Inflatable hot air welding machine is cylinder bed hot-air seam sealing machine to join thermoplastic fabrics such as PVC,TPU / PU, PE, PP and various other technical fabrics. 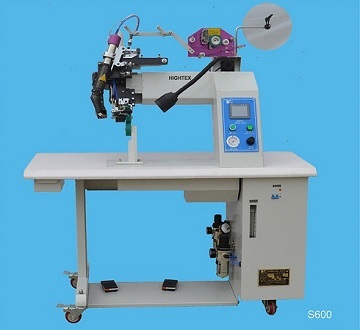 This hot hair welding machine is modified by model S700, special for welding head of inflatable boats. The versatile cylinder bed design is very useful when welding shaped items or curves panels etc. Service and support are important considerations in your selection of a hot-air welding machine. We understand how critical it is that your equipment work correctly. 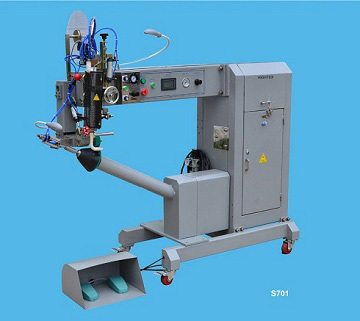 This hot air welding machine is ideal for the fabrication of inflatable boats, rubber boats, outdoor awnings, trampolines, tarpaulins, luggage and suitcase, Air Balloon, tents, banners and billboards, ducting / ventilation, geo liners, filtration products, military tents and other military products.